Attack on Titan Episode 36, “Charge”, opens with rapid intensity as Ymir catapults through the forest with the scouts following closely behind her. She’s remarkably fast when in Titan form and braces toward the clearing with Krista locked inside her mouth. Bertholdt, with an unconscious Eren bound to his back, notices Ymir quickly drawing in on their position and prompts Reiner to transform. Charging into the distance, the Armored Titan makes off into the sunset, hoping finally to return home with those that he and Bertholdt were initially ordered to retrieve. In the final moments before the introduction, Commander Erwin, with the aid of various military branches, instructs all squads to move forward. Albeit the massive horde of Titans chasing quickly behind them, Erwin ignores the immediate danger, understanding fully that this may be the scout’s last chance at reclaiming Eren: humanity’s single, remaining hope for survival. As the episode presses forth, we see Mikasa’s willingness to retrieve Eren no matter the cost. Whether it be mere bloodshed or the act of delivering death, she promises to take any action, against not only Bertholdt and Reiner, but Ymir too if necessary. Her passion is blind and embodies the energy that Erwin is trying to instill in his soldiers during this pivotal pursuit: retrieve Eren over everything. Just slightly ahead of the troops, Ymir pulls Krista from the clutches of her slimy mouth as she begins to emerge from her Titan shell. Krista awakens in shock, bound by the grip of Ymir’s giant hand. Naturally, she has questions, demanding an immediate explanation for her capture. At first, Ymir tries to reason with her. Explains that she has no desire to be rescued by the Survey Corps because life will be better for them both outside of the walls. She pleads to Krista, calling her by her real name, Historia, stating that they’re headed for a place where no one will consider them pitiful and worthless. This doesn’t resonate with Krista initially and she responds desperately, telling Ymir that she’s making no sense, wondering aloud if Bertholdt and Reiner have threatened her into the situation she’s currently in. Ymir pauses as Krista screams that they can get out this together, that they can take on Reiner and Bertholdt and return back to the regimen where it’s safe. She promises Ymir that she’ll be her ally no matter what, even if there are things in which she cannot reveal, begging for her to let her go so they can both escape. After Krista is finished arguing for her side, Bertholdt notices pause in Ymir. He begs her to think of what she’s done. Signaling towards the troops, who are quickly closing in on their position, reminding Ymir that it’s her fault their chances of escape are now so low. Exclaiming that they’ve lost so much ground due to her selfish desire to have Krista with them on their journey. “Hey, Ymir… are you telling us we did all that for nothing? Did you change your mind? Is that really what you want? Letting Krista rot within the walls? The internal struggle of morality versus survival seems to be too much for her and we see Ymir start to mentally crack. She goes on to tell Krista that long ago she stole Titan powers and has since been running from persecution. She explains that her one hope of survival is to deliver Krista to the Titans as penance, claiming that her thievery would be forgiven if she turns over a royal member of the sacred family. Ymir finishes her ludicrous speech with a bit on being afraid to die, begging for Krista to save her. In some strange, lovesick way, Krista empathizes, promising Ymir that no matter what happens she’ll always be her ally. They’re both clearly deranged and bound to one another in an obsession that’ll likely prove sour, as reason and rationality seem to be missing from the equation. All at once the episode comes to a climax. Eren finally regains consciousness and the soldiers begin their attack. The troops deploy themselves onto the Colossal Titan using ODM gear as Ymir tries to swat them away with her Titan body. After throwing a soldier to his death, Ymir shrieks in terror as Mikasa slices her right eye out of the socket with precision and speed. Immediately after, Mikasa lunges towards Eren. But before she can get to him, Reiner, in Armored Titan form, uses his massive hands to shield Bertholdt and Eren from her and the others. Ymir continues to interfere, complicating an already hellish situation for the Scout Regimen, so Mikasa decides to eliminate her as a threat. In the following scene we see Krista start to spin her own web of lies, jumping in front of Mikasa, begging her to stop her attack. Krista claims that Ymir is being forced to fight against her own will and begs for her sympathy. Mikasa, albeit the heartfelt plea, explains to Krista that she has no room left in her heart for anyone else other than Eren, and deems that she get out of her way if she too doesn’t want to die. Krista commands for Ymir to stand down. With the threat neutralized, Mikasa and the troops continue on with the mission. Landing on Reiner’s plated hands, Mikasa, Armin, Connie, Sasha and Jean arrive ready to retrieve Eren and retreat. Albeit Mikasa and Armin’s purely focused mindset, it’s clear that the three others are still struggling with the reality of the situation: that their once beloved comrades and friends are now their greatest enemies. As Connie, Jean and Sasha peer in, they question Bertholdt and Reiner, asking if everything they experienced together was a lie. Mikasa cuts the sentimental banter short. She reminds the scouts firmly that they’re nothing more than the Armored and Colossal Titans. Reiterates that they are not their comrades, and what’s important now is to save Eren and slice the nape of their necks. This monologue greatly amplifies the mystery surrounding Reiner and Bertholdt’s mission. Who is it that they’re fighting for? Are they fighting against their own free will? It’s seems obvious now that there’s a puppet master in play. But who is it that’s pulling the strings? The remainder of the episode showcases a culmination of tactical events. On one side, Commander Erwin leads his soldiers followed by a group of steadily pursuing Titans, right into Reiner’s position. On the other side, Hannes and his respective squad reach the target spot, warning Mikasa, Armin and the others to disperse from Reiner as they’re on an impeding collision course with destruction. The Scout Regimen and other military groups manage to avert the Titan battle and await further instruction from the commander. Erwin’s plan, to engage Reiner and the horde of Titans, is well underway. Needing to protect himself from the vicious attack, the Armored Titan is forced to remove his hands. This leaves Eren, who’s still tied to Bertholdt’s back, completely exposed. Erwin screams to advance while simultaneously being torn from his horse by a ravenous Titan. The regimen is stunned still, but the commander continues, “ADVANCE”, as he dangles in the air. The troops press forward. Mikasa, seeing her one chance to retrieve Eren, enters into the madness. Albeit reaching her target, Mikasa falls short and appears to descend into a Titan’s clutches when Jean, at a critical moment, interjects, slicing and dicing, temporarily saving Mikasa from annihilation. Berthold, whose feelings for Annie have always been obvious, cuts himself free from Reiner’s hand breaking the tie that’s kept Eren fastened to him this whole time. As he lunges towards Armin, Mikasa moves in quickly to recover Eren as he falls from the clutches of his captors. At the same time, Commander Erwin escapes from the Titan who took his arm, and screams for all to retreat. It seems as though everyone, including the clever Armin who used Bertholdt’s emotional empathy against him, are now headed back towards safety away from the Titan battle. Even Krista, who’s recovered by Connie after achieving her first Titan kill, is now being carried safely away from the danger. Sasha and Connie seem to instill some sense into her, pointing out the foolishness of blindly following Ymir in this war. Optimism seems to instill itself in the troops as they make their escape. Then the sound of a loud crash is heard. 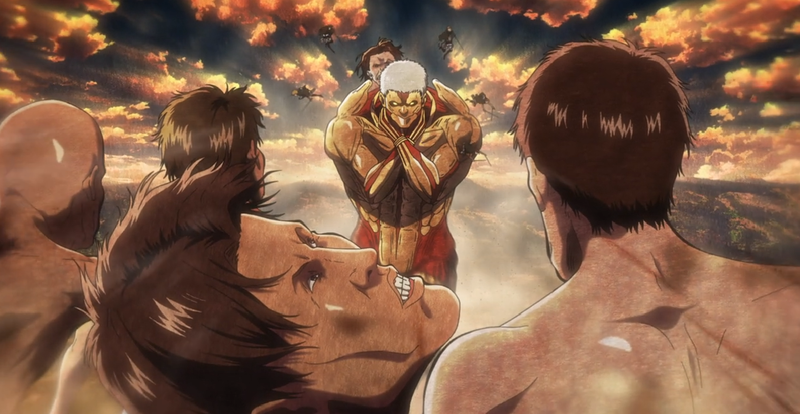 Reiner, in a final effort to return home with whom he’s fought so hard to capture, begins catapulting Titans through the air in the direction of the troops. He lands the target in which he’s aiming for. Hannes and Armin look back in horror to see that Mikasa and Eren have been hit, and now lay vulnerable in Titan territory, injured and horseless. As the smoke clears, Eren and Mikasa see a massive figure closing in on their position. As the beast’s face becomes visible, it’s the haunting familiarity that paralyzes both Eren and Mikasa, as the Titan steadily approaches. Not for a single second is there question as to who this monster is. And in the final seconds of, “Charge”, we see the bone-chilling smile of the Titan who slaughtered and devoured Eren’s mother in the very first episode of Attack On Titan, Season One.